"Within the first part of the Book of Mormon there is a place which is named 'Nahom.' According to the book it is found a fair distance south from Jerusalem and is near the location where the family turns east in their journey. It is also the location where a member of the family ends up being buried. In 1988, an excavation in Yemen began that would later result in the discovery of an altar bearing the inscription of a location which is phonetically sounded out as 'NHM.' It is written in ancient Sabaean. Ancient Sabaean, like Hebrew, does not include written vowels. Unlike the Hebrew language, Sabaean does not have a written system for vowel indication. In Hebrew the sound of a vowel is determined by how the letters are used. Currently the area is searchable on Google maps by the name 'Naham, Yemen.' Critics usually point out the vowel discrepancy, yet even with this one vowel variation the rest of the claim matches the location. Naham is found a fair distance south of Jerusalem. It is the area where the ancient Frankincense trail turns east, and the Awwam temple found about 1 km east of where the altar was found was used as a massive burial site during the claimed time period. None of this was known during the 1800s when the Book of Mormon was published. The excavation on the Awwam temple did not start until 1951 and the Frankincense trail was not mapped until 1997." Images of the altar and other references are available at the source. Part of the first book within the Book of Mormon records a journey of the family of Lehi who leaves Jerusalem and heads south. The book contains some very descriptive information about the journey through the Arabian Peninsula, including traveling times, landmarks, and location names. At one point the book identifies that the family stops at a place that was called Nahom. Several key events are recorded at and around this stop. According to the Book of Mormon the family travels south making several stops along the way. One of the significant stops is a location where one of the members of the group, a man named Ishmael, dies. The following verse notes that Ishmael is then buried in Nahom. This indicates that the family camped near the location of Nahom at the time of Ishmael's death. From here the family changes course and continues their journey eastward. "And it came to pass that he departed into the wilderness. And he left his house, and the land of his inheritance, and his gold, and his silver, and his precious things, and took nothing with him, save it were his family, and provisions, and tents, and departed into the wilderness. And he came down by the borders near the shore of the Red Sea; and he traveled in the wilderness in the borders which are nearer the Red Sea; and he did travel in the wilderness with his family, which consisted of my mother, Sariah, and my elder brothers, who were Laman, Lemuel, and Sam." A lot of events happen while the family is camped at this location. The journey doesn’t resume until 1 Nephi 16:12-13 at which point they travel south-southeast. "And it came to pass that we did take our tents and depart into the wilderness, across the river Laman. And it came to pass that we traveled for the space of four days, nearly a south-southeast direction, and we did pitch our tents again; and we did call the name of the place Shazer." This is the camp where Ishmael passes away. "And it came to pass that Ishmael died, and was buried in the place which was called Nahom." "And it came to pass that we did again take our journey in the wilderness; and we did travel nearly eastward from that time forth. And we did travel and wade through much affliction in the wilderness; ..."
One of three altars discovered at the Bar&apos;an temple bearing the inscription of "NHM." A discovery in Yemen provides support for the name that is found in the Book of Mormon. 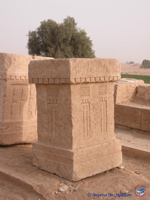 In 1988 in Ma'rib, Yemen an excavation team began an excavation of the Bar'an temple. This site would produce three altars which bear the same inscription, identifying a place that coincides with the name found in the book. The inscription identified a place that is sounded out literally as NHM in English. A total of three altars bearing this inscription have now been found at this site. There is a common misconception about this altar's language. Many LDS apologists and critics use the Hebrew language to both defend and critique the inscription. The problem here is that the altar is not actually inscribed in Hebrew. It is written in an ancient language called Sabaean. Like Hebrew, Sabaean does not have any characters to represent the common vowel sounds that we have in English (a, e, i, o, u). Hebrew gives you hints to the vowel sounds by the way that the consonants are used in a word. If you review the letters around where a vowel sound should be you can determine what it should sound like in Hebrew. Sabaean is different in that it does not contain any indication of what the vowel sounds should be. This specific altar has the word wrapped on the corner of the altar. At least one of the other altars has the word on a single side. This image comes from a photograph taken by Roswitha and Roland Mosler over at Impetus In Mundum and is used with permission. When you speak the first character in Sabaean, it makes the same sound as our English N makes (as in 'Nancy'). The second character makes the same sound as our H (as in 'hat'), and the third makes the same sound as our M (as in 'Mary'). Thus the word makes the sound "NHM." We know the H is not silent because the second character makes the sound of a voiceless H. This is the same h as found in 'hat,' home,' and 'helium.' Voiceless is a phonetic term used to describe if your larynx vibrates when saying the sound. For example, z and s make a similar sound in English, however, the s is voiceless and the z is voiced. If it was silent it would look like a three pointed trident in Sabaean. So thus we have the place of NHM which can be pronounced phonetically the same as Nahom, Naham, Nahum, and Nehem. Other scholars have claimed that it may be pronounced as Nihm and Nahm. The altars date between 700 and 600 BC. According to the Book of Mormon the family that buries Ishmael at Nahom left Jerusalem at about 600 BC. "Bi'athtar, son of Sawad from the tribe Naw' from Nihm, has dedicated to 'Almaqah Fari'at. By 'Athtar, by 'Almaqah and by dhat-Himyam. By Yada'il and by Ma'dikarib." A screenshot of Google Maps from November 23rd, 2012 of the Bar'an and Awwam temple sites. Even if we ignore the exact spelling of the name that is in the Book of Mormon, the other evidences that come from this section of scripture also align with this area of Yemen. According to the Book of Mormon, Ishmael is buried at this site. One of the largest ancient burial sites in Yemen is located less than one mile to the east of the Bar'an temple where the altars were discovered. The site is known as the Awwam temple. The cemetery here contains more than 20,000 burials that date as early as 700 BC. The first excavation of the Awwam temple was not started until 1951. This area is also the point where the Frankincense trail, which was the trail that was used to bring frankincense to Jerusalem, turned east towards the distant shores of the Arabian Peninsula. The route of the trail was discovered in 1997. Ma'rib was the largest of the caravan cities on the Frankincense trail and the crucial juncture where the trail turned east. Ma'rib sits at the west end of the valley that connects the eastern shores to the western trade routes. This is the same area that the Book of Mormon claims the family turned east in their journey. This area can be found on Google maps by searching for "Naham, Yemen." The country name is required because of other places known as Naham. At the time of this writing (11/2012) this will take you to Jibal Naham which means Mt. Naham. This is the mountain just west of Ma'rib. 1 Nephi 2:4-5 - Found on page 7 at the last paragraph of the page. 1 Nephi 16:12-13 - Found on page 39 about 3/4 of the way down the page. 1 Nephi 16:33 - Found on page 41 just above the middle of the page. 1 Nephi 16:34 - Found on page 41 at the middle of the page. 1 Nephi 17:1 - Found on page 42 at about 1/4th of the way down the page.